Flower pattern carpets can be used for decoration apart from being functional. Flower is one ingredient used in decoration that you can use to show creativity and to enhance the beauty of your room or on an event setting. 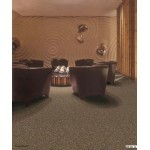 This brown carpet can be used at the entrance corridors, offices and bedroom. Brown carpet is a popular family-friendly choice for busy homes because it hides dirt well. Designed to complement both traditional and contemporary home interiors, brown carpet has an earthy appearance that disguises marks well, making it an ideal choice for family spaces.